Discover where the Libraries are going. We are charting a course for the University Libraries and its users to thrive in the Fourth Industrial Revolution, a future largely driven by the convergence of our physical, digital and biological worlds. 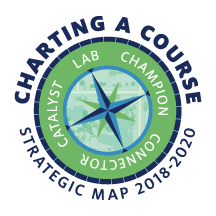 Our strategic map identifies four directions that will take the Libraries to new levels of impact as essential contributors to student and faculty success. In support of the University of Arizona’s land grant mission, we will be vital partners not only on campus, but also in the broader community. We’ve developed a strategic map instead of a strategic plan because of the additional flexibility it provides in our rapidly changing environment. We know where we want go, and we’re committed to four long-term directions. We also know that there are many ways to get there. As we move forward, we'll periodically adjust our course toward these directions through new actions and opportunities over time. An interdisciplinary physical and virtual lab that transforms the way people teach, learn, research and work. A catalyst in the UA community for inventing creative approaches to knowledge creation and dissemination. A champion of diversity, social justice and equity in our organization and in how we work with campus and community colleagues. A connector of people, resources and ideas. See our complete strategic map.